Among our collaborators and mentors is the wonderful banjo-player, vocalist, song-writer and world traveler, Julie Elkins. She was born and raised in Montana and continues to be inspired by the beauty and wide-open spaces of the Big Sky Country. A close listen to her soulful voice belies the traditional music of the Bluegrass State of Kentucky, the roots of her family. She counts among her cousins Loretta Lynn and Patty Loveless. 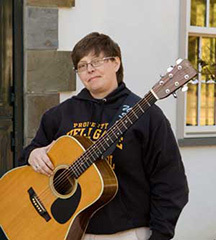 Julie has taken this sound overseas, touring and teaching in Europe. She has recorded and performed with Wheel Hoss, New Vintage, Kanes River and Elkins and Thompson. Pitching his tent at a bluegrass festival next to a sweet girl from Carthage may not have seemed like a life-changing event, but for Jan Johansson, it was the beginning of planting his feet firmly in Tarheel soil. 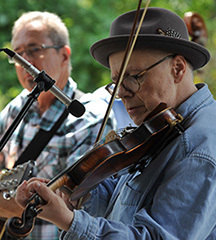 Born and raised in Sweden (the European country, not the little town in western North Carolina, as rumored), Jan came to the U.S. to study linguistics and travel to bluegrass festivals. Soon Jan was known far and wide as a devoted student of the Monroe Style and was welcomed into the homes and hearts of friends and fellow musicians alike. The Kudzu Ramblers came about as one of Jans student bands. One might say hes been “instrumental” in guiding the Ramblers in their musical endeavors.